I’m quite certain I have a love-hate relationship with crème brûlée – I love how it’s so smooth and creamy with a crunchy caramel top, but other times I hate it because it’s too thick and creamy that it becomes very jelat to eat (jelat is a Hokkien term, and I can’t really explain it, but it somehow means a point whereby the taste of the food is so strong that your stomach feels uncomfortable after eating a lot of it). 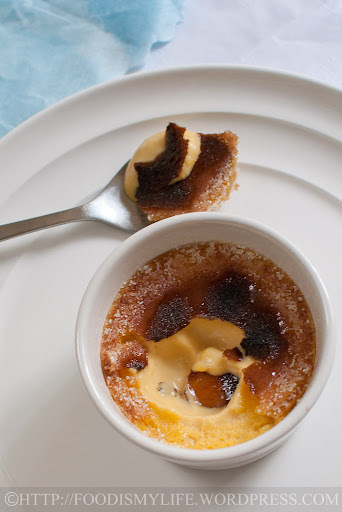 Because of the above fact, I’ve never tried making a crème brûlée, until the Bake Along! I’m so happy to be baking again alongside with these wonderful ladies – Joyce from Kitchen Flavours, Lena from Frozen Wings and Zoe from Bake for Happy Kids. I decided to make an alcoholic version as I still have some Baileys left – I didn’t have a blow torch unfortunately so I used the broiler setting in my oven. I would strongly suggest freezing the crème brûlée for 20 – 30 minutes before putting it under the broiler so that the custard doesn’t melt and end up cooking again (which was what happened to my first batch of crème brûlées…) One downside of using the broiler is the lack of control on how the sugar caramelizes – the sides of my crème brûlée did not caramelize… but the centre was already burnt so I had to remove it from the oven. 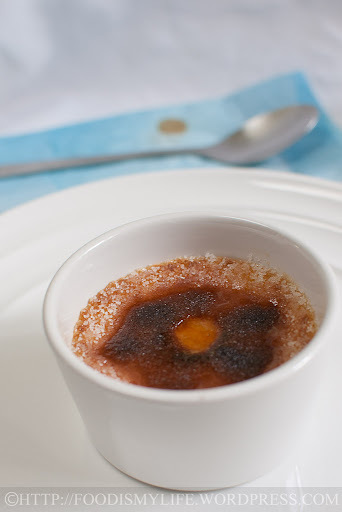 Taste wise, X didn’t like it – I think the texture of the crème brûlée doesn’t appeal to him haha. As for me, I like the crunch of the sugar with the soft and silky custard, but I can only eat a very small portion at a time, as I’m not a huge fan of crème brûlées. Nevertheless, it was a fun experience learning how to make crème brûlées! Preheat the oven to 150 degrees Celsius. Place two ramekins in a deep roasting pan. Boil a kettle of water. Place the heavy cream in a small pot. Heat the cream over medium to medium-low heat until the cream comes to a simmer (small bubbles appearing on the side of the pot). Don't let it boil and bubble vigorously. While the cream is heating, place the egg yolks in a heat-proof bowl. Add in the sugar and whisk with a wire whisk until some of the sugar has been incorporated. When the cream has come to a simmer, scoop a ladleful of hot cream and pour it in a slow and steady stream into the egg yolks, whisking it all the time to bring up the temperature of the eggs. This is called tempering. Stir in the remaining cream, taking care to stir gently and not whisk anymore to prevent incorporating too much air into the custard. Stir in the Baileys. Strain the custard into a measuring jug and divide it among the two ramekins. Use a small spoon to scoop out the foam and bubbles on the surface of the custard. Fill the roasting pan with the boiling water until the water level reaches halfway up the sides of the ramekins. Bake for 20 to 25 minutes, until the crème brûlée is just slightly wobbly in the centre. The top should remain pale in colour and not browned. Remove the ramekins from the hot water bath and let it cool to room temperature. Refrigerate for at least 4 hours (preferably overnight) and up to 3 days. Broiler: Freeze the crème brûlées for 30 minutes and preheat the broiler. Sprinkle sugar evenly on the top and broil for 3 - 5 minutes, until the sugar has caramelized. Blowtorch: Remove the crème brûlée 15 minutes from the refrigerator before serving. Sprinkle sugar evenly on the top and melt and caramelized the sugar using the blowtorch, taking care not to burn the sugar too much. Leave the crème brûlée aside for 1 minute and serve immediately. Do hop over (click the cute little frog!) to see other blogger’s crème brûlées! You’re welcome! I hope you make them soon! I want to make creme brulee at home, but dont have a blow torch. Have thought of using the broiler to get the effect, but I always forget about it when it comes to dessert planning! Love that you added bailey’s! Thank you! Oooh I have Kahlua as well, it sounds good in a creme brulee! Thank you 🙂 I wish I can send one over! I have no idea as well… There’re too many types of oven out in the market! This Baileys post and your last one are so delicious looking! Great job! Thank you Jeannie! Yea it can get a bit too rich for me, but I had fun making them! Thanks for visiting, take care! Thank you Alice, I hope you will give them a try! I had fun caramelizing the sugars even though I’m not very fond of eating them… haha. I’m not sure whether my oven has a broiling function or not too haha. I preheat the top heating element to the maximum temperature then place the brulee on the tallest rack possible (which is about 2-3 inches away) and then heat it for several minutes, turning them two, three times for even caramelizing – which didn’t really happen for me sadly, but it worked for Joyce (Kitchen Flavours)! Happy baking! My oven doesn’t come with a broiler function (don’t remember reading it on the instruction manual haha), I actually preheat the top heating element to the maximum possible (250 degrees Celsius), then place the brulee on the highest rack possible (2 – 3 inches away from the heating element) and heat it for several minutes (I wonder if this is actually considered a broiler?). The sugars didn’t caramelize evenly, but I guess that’s the best alternative if one doesn’t have a torch or a broiler! Lovely smooth texture, looks delicious too, and yes, I too do not like to eat too much of this too! A little goes a long way for me where cream brûlée is concerned! Great job though! Yea I think a blow torch will work better as well. Having a salamander will be a luxury! I wish I can love creme brûlée whole heartedly but my stomach is being quite picky about them. Hope you’ll like the recipe! I like creme brulee occasionally, I made a really nice pumpkin flavored one in the fall but you are so right, you can only eat so much and then it gets to be…what did you say? Jelat? That’s a fantastic word if I understand it correctly. I used to go to a restaurant that made a lemongrass ginger brulee, very simple, not over flavored and soooo good to share. your idea is great, i love baileys and i guess it tastes great in creme brulee! First time I used one I didn’t realize that the sugar continues to cook even after you remove the flame, you just have to know when to stop so it doesn’t get burnt. It’s much better results than a broiler unless you have a salamander which I don’t. Omg, I meant turned! I have no torch, so I thought I couldn’t make one of these, but I love how you use the broiler! This is a challenging bake indeed! Yes, eating more than one is jelak, but we did finished one each and we enjoyed it, maybe the cherries and booze helps making it taste good! Caramelizing the brulee is the tricky part. I used the broiler function in my oven too, and turned the position of the pan with the ramekin after a couple of minutes to ensure even browning. This is indeed a challenging bake! Thank you for baking along with us! Thank you Angeline, I was a bit disappointed with the burnt sugar, but I guess that gives me a reason to buy a blow torch! :p Thank you for visiting! like i was telling angeline earlier, not really jelat but i really cant take more than one! i think it’s because of the richness and the eggy thing. Me too got a problem with the caramelising, like you, i also think i sprinkled too much sugar on the surface. Nevertheless, it was a good bake as if it was not for the event, i dont think i will ever start making a creme brulee. I want to get a blow torch too… I guess I need to wish for one from Santa! Have fun! Your crème brûlée looks so smooth and velety inside. Very nice! Looks really beautiful, perfectly executed. A blow torch can also be tricky you have to pull back before you think its done or it burns. Definitely an art form mastering either broiler or blow torch method. You seem to have mastered it. Well done. Yours look smooth inside and that is definitely a creme brulee it’s really burning and caramelizing. Glad to found your blog. I’m going to have to try this one.. I just bought a blow torch at Christmas and have only used it for my wee meringue tarts.. This would be so fun to make! !